View More In CD Drives. There are so many options, why choose OfficeWinner ? △ All OfficeWinner products are manufactured according to quality management. △ Guarantee and free permanent technical support. 2.Click on the desktop, open the "my computer", in "the mobile storage device should display the drive icon"
Please feel free to contact us at anytime if you have questions. We will reply you within 24 hours and solve your problems as soon as possible. 【COMPACT DESIGN】Made with premium wire drawing material, enough fashionable and scratch-proof exterior. This CD/DVD driver is slim, lightweight, compact, portable. The CD/DVD drive and the USB cable are combined in one, embedded USB cable design, easy for storage. 【PLUG AND PLAY】No need for any additional software and extra power supply. Just Plug external DVD drive into laptop USB 3.0 interface, press pop-up button and put disc on tray, it will be automatically recognized and play, it's ease of use. 【USB 3.0 TECHNOLOGY】This ultra slim DVD burner adopted USB3.0 technology. 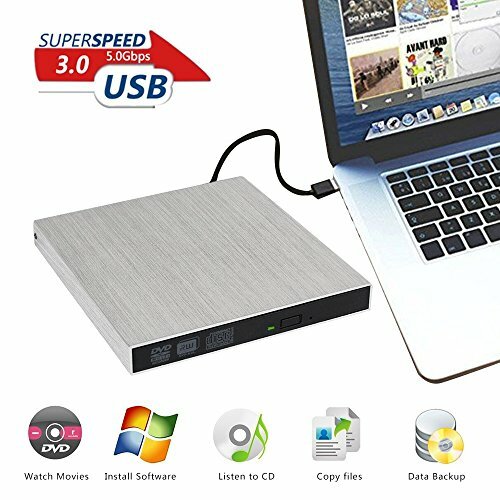 High speed USB 3.0 external DVD drive for laptop with low impedance & anti-interference ability, bring you faster and smooth experience during movies, musics or burning.It allows faster data transfer speed. It is also compatible with USB2.0, efficiency more stable, applies more widely. 【UNIVERSAL COMPATIBILITY】This CD/DVD drive writer/burner is ideal for various devices. Compatible with windows 2000/XP/2003/Vista/7/8.1/10, Linux and all version Mac OS systems, supports any PC, Ultrabook and Netbook. 【HIGH SPEED】Adopted unique intelligent burning technology, this CD-RW combo drive supported DVD+R, DVD-R, CD-ROM, DVD-ROM, CD-R, CD-RW. Max DVD read speed 8X; Max CD read speed 24X and max CD burn speed 8X. This external dvd drive equipped with brand new chip with strong error-correction ability, plays music and movies with no lag or distortion. If you have any questions about this product by OfficeWinner, contact us by completing and submitting the form below. If you are looking for a specif part number, please include it with your message.